Not only has the imaginary kilted boy followed her to Alloway, she and Mackenna uncover a strange set of rings and a very unnerving letter from Mackenna’s great aunt—and when the girls test the instructions Aunt Gracie left behind, they find themselves transported to a land that defies explanation. 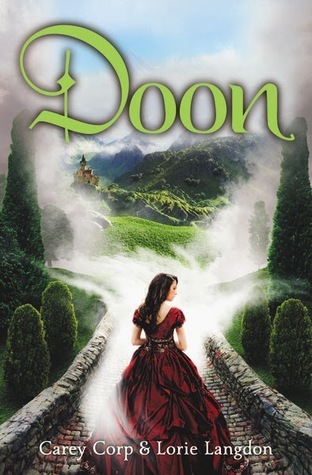 Doon seems like a real-life fairy tale, complete with one prince who has eyes for Mackenna and another who looks suspiciously like the boy from Veronica’s daydreams. But Doon has a dark underbelly as well. The two girls could have everything they’ve longed for…or they could end up breaking an enchantment and find themselves trapped in a world that has become a nightmare [x]. Review: Doon was loosely based on the premise of the musical Brigadoon. I have not seen or heard of that musical so I cannot comment on the similarities of the two. However, I am now interested in seeking out this musical after reading this book. To be honest I read this as it was set in Scotland and had just recently purchased Outlander and wanted to get into the Scottish setting before tackling such a large novel. The two female characters were your stereotypical high school popular teenagers or at least that’s how the authors made them sound like. It was really annoying. I feel like they tried too hard to make them sound like teenagers. The duo narration, I think maybe one POV would’ve been better. I mean I ended up being interested in one character and not so much the other. I have purchased the second book in this series… I’m unsure when I will give it a try but I hope the story and narrative got better. Awesome review, Danica! You so nailed my feelings on this one. I think I ended up giving it a 2.5. I loved the premise but this just ended up being way too lightweight for me. I would have loved more world building. Actually feeling like I was in Scotland – or feeling like I was in a magical/mystical realm. A gorgeous guy custom made for each girl was just too perfect and smacked of pre-teen fiction. But the thing that got under my skin the most was the way Mackenna spoke. Yes she was a theater buff but I've yet to meet one who uses phrases like “Holy Hammerstein” and “Sweet Baby Sondheim.” OMG, it made me want to gouge my eyes out every time. LOL I really, really wanted to love this one but it just felt like something written for moony 12 year olds.